This new 6-week series begins Thursday evening, September 13. 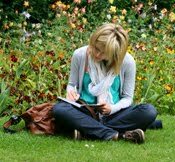 In these weekly journaling circles you will will learn a variety of profound and enlightening exercises, techniques, questions and quotations to nurture the writer and soul-seeker within. Expand your journal-writing skills, uncover deeper layers of personal meaning and become more familiar with your authentic inner voice. Join us as we confront and disarm the critical inner voices that keep us stuck. If you're like most of us, you have a nagging critic in your head that tries to prevent you from stepping outside of your comfort zone. In this transformative half-day workshop we will use journaling and other forms of creative expression to meet the Inner Critic, embrace it and use its power to bring freedom rather than inhibition! Join us each week in the beautiful library at Deborah's Palm for some inspired journaling. I will provide instruction and handouts for new techniques and offer evocative prompts for your writing. You will have time to practice your journaling, get a little coaching, and share with others in the group. It's a wonderful opportunity to take time away from your busy life, and get re-acquainted with your soul! In this half-day class we cover everything you need to know about starting a regular journaling practice -- from selecting your journal, choosing pens, finding the time to write, and insuring privacy, to specific techniques and prompts for facing the blank page. 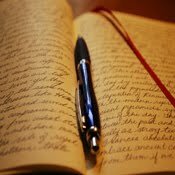 You'll learn the most basic journal-writing techniques for recording your life's story as well as for inner growth and healing. This 6-week workshop takes you further into the experience of journal-keeping with each of the basic techniques for recording your thoughts, experiences, feelings, dreams and uncovering your unique answers to life's questions. Through guided imagery, visual prompts, poetry, and other creative writing explorations you will learn inspiring ways to record your life's journey. In this 6-week class, we will be exploring the depths of our emotional lives through journaling. You will learn writing tools to help you to understand, articulate, release and support the healthy flow of your emotions, in a nurturing, creative and supportive circle.